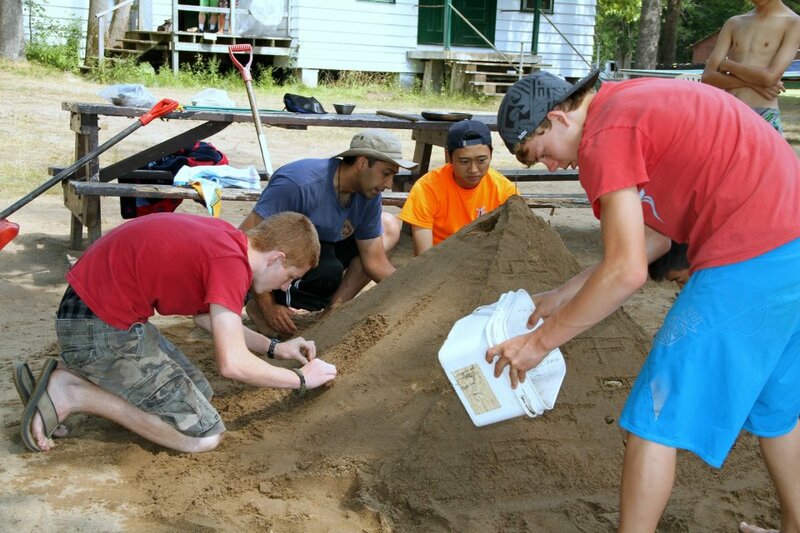 2012 July | Federation of North-American Explorers | Semper Parati! We have no troop leaders, no Timber Wolf leaders, no Wayfarer leaders, but only Wayfarers that are on duty for every service that calls us to follow the example of Christ. Please see our previous entries here (Day 1), here (Day 2), here (Day 3), and here (Day 4 Part 1). The boys (and some of the junior leaders!!) took part in a sandcastle-building contest. Then, once the second-year Timber Wolves arrived back in camp from their overnight hike, Akela Chris and Hathi (U.S.) arranged for an obstacle course “Iron Man” contest, including rope-climbing, rappelling, canoeing, and swimming — all while keeping a special message dry. Kateri, or Catherine, Tekakwitha, known as “the Lily of the Mohawks,” was born in 1656 at Ossernenon (modern-day Auriesville), New York (or, according to some authorities, the village of Gandaouge which lay on the south bank of the Mohawk River) and died on April 17, 1680 at Caughnawaga (Kanahwake or Sault St. Louis), an Indian reservation in what is now Quebec, Canada. Her mother was a Christian Algonquin; her father a Mohawk. When she was only four years old, her family fell victim to an outbreak of smallpox; her father, mother, and brother died of the disease and she was left scarred and partially blinded. Tekakwitha was adopted by her uncle, a chief of the Turtle Clan. 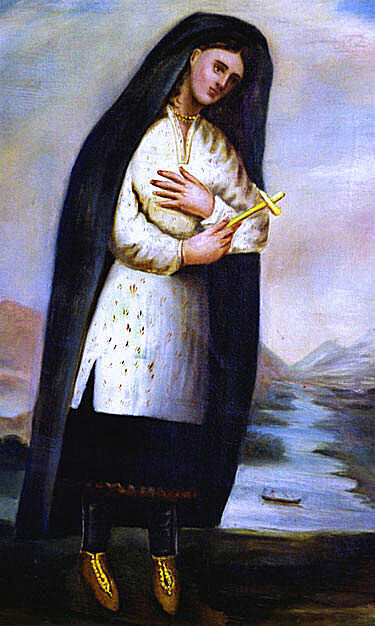 Tekakwitha had her first contact with Jesuit missionaries in 1667. Her uncle was opposed to religious conversion, however, and she was not baptized until 1676, a year after she met Fr. Jacques de Lamberville. She was baptized on Easter Sunday, April 18, and took the name “Catherine.” She must have been very devout, as Jesuit policy at the time was not to baptize natives unless there was no danger of back-sliding. After her baptism, Catherine did not remain in her village long, as she was accused of sorcery and sins of impurity. At Fr. de Lamberville’s suggestion, she left for the Christian village of Kanahwake (Sault St. Louis), where she spent the remainder of her short life. At Kanahwake, Catherine and other native converts practiced corporal mortification to repent for their sins and those of their nation. The Jesuit missionaries had difficulty in regulating the pious women’s mortifications! And even here, there was pressure for Catherine to be married. Fr. Pierre Cholenec, whose advice she sought on the matter, records her as stating: “I have deliberated enough. For a long time my decision on what I will do has been made. I have consecrated myself entirely to Jesus, son of Mary, I have chosen Him for husband and He alone will take me for wife.” Catherine made a vow of perpetual virginity on the Feast of the Annunciation (March 25), 1679. Her health, always poor, was made worse by the mortifications she practiced (but which she refused to give up), and she died in 1680. After her death, the scars which had so disfigured her face miraculously disappeared. Kateri Tekakwitha was beatified on June 22, 1980 by Pope John Paul II. She is scheduled to be canonized on October 21, 2012. Her feast day is celebrated on July 14 (United States) or April 17, the date of her death (Canada). Please see our previous entries here (Day 1), here (Day 2), and here (Day 3). We began the day with morning prayers (the Divine Mercy chaplet), confessions and Holy Mass (thank you Fr. Matthias! ), and breakfast. Most of the second-year Timber Wolves then headed out for an overnight hike at Balsam Lake Provincial Park with Keneu, Bagheera, and two Wayfarers (some of the Timber Wolves, who had been on the hike the previous year, but who were still too young to go on the third-year overnight canoe trip, opted to stay in camp. In the end, 11 Timber Wolves set out – a number which would prove to be Providential). We arrived at the camp site in the late morning and started to set up camp. The first task of the overnight trip would be to set up our tents. That done, we ate a quick lunch of some ramen noodles (N.B. :apparently in Canada only the ramen flavor instant noodles are called ramen; these were chicken flavor), gathered together a few belongings, and set out on our hike (with plans to go for a swim afterwards). Please see our previous entries here (Day One) and here (Day Two). The entry for our first day of summer camp can be found here. 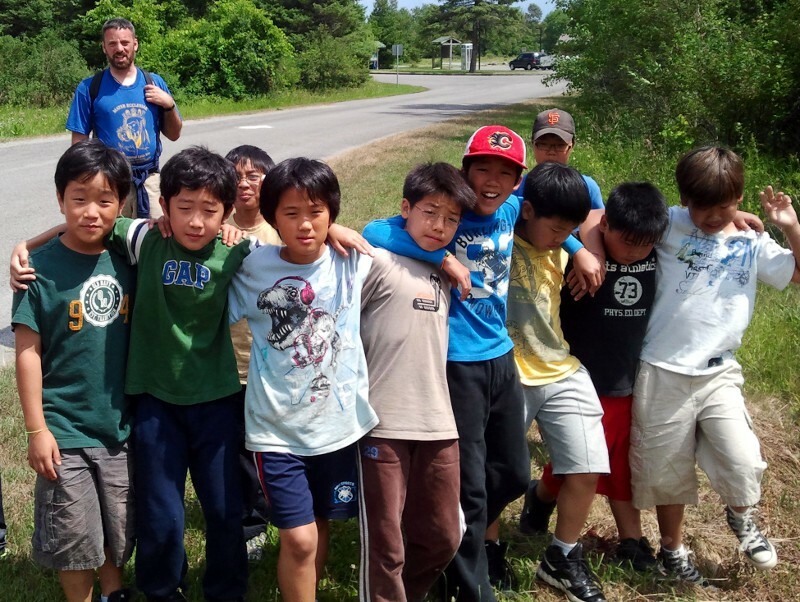 Saturday, July 7 was “Warrior Day” at Camp Endobanah. We began the day with morning prayers, Mass, and breakfast as usual (the cooks made a delightful breakfast of scrambled eggs and bacon). The leaders spent some time working with the Timber Wolves on their “star” programs — Akela Chris with the Timber Wolves preparing for their promise badge, Hathi with those working on their first star (including all of our North Star Timber Wolves), and Bagheera with those working on their second star. Then to the lake again for some important lessons from Keego and a morning swim!